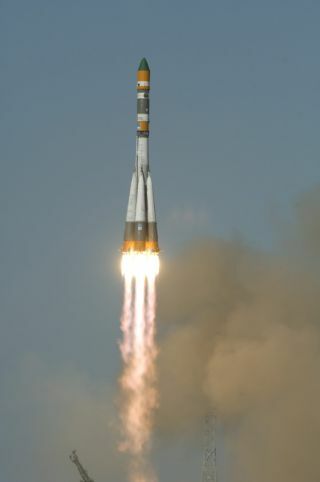 The Soyuz-U rocket launched from Baikonur Cosmodrome, Kazakhstan, at 13:00 CEST (11:00 GMT) on 14 September 2007, for the start of the 12-day Foton-M3 mission. MOSCOW (AP) -- Forgete-mail. How about space mail? In an experiment combining elements of a packagedelivery service, the sport of kite surfing and a REALLY big fishing reel,Russian and European engineers on Tuesday sought to pioneer a technology thatcould be used in the future to retrieve cargo from space. The experiment involving a19-mile, super-strengthtether hit a glitch, however, when the line failed to unwind fully, butRussian Mission Control said it hopes to salvage the test by recalculating thelanding capsule's orbit. "Even a fishing linecould get stuck sometimes," Mission Control spokesman Valery Lyndin toldThe Associated Press. The second Young EngineersSatellite, whose preparation involved nearly 500 university students fromEurope, Japan, North America and Australia, was launchedinto orbit Sept. 14 on a Russian-built Foton-M3 spacecraft, along withother European Space Agency experiments. The goal of the YES2experiment was to deliver Fotino -- a 12-pound reddishspherical capsule the size of a beach ball -- to Earth with the help of along tether made of a substance the European Space Agency described as theworld's strongest fiber. In the experiment, theFotino, held in a metal brace by straps, was to be shot out from the Foton-M3spacecraft with springs asthe tether gradually unwound, swinging the capsule forward into a lowerorbit about 18 miles below. About 2 1/2 hours later,after gravity takes firm hold and the entire unit swings in a vertical positionbelow the spacecraft, the Fotino is then released from its straps and glidesthrough the atmosphere for about 20 minutes before a parachute deploys and thesphere bumps to a landing in the steppes of the Central Asian nation ofKazakhstan. The capsule has a thermalshield to protect it from the searing heat of re-entry through the Earth'satmosphere, while the tether and the holding clamps burn up. The experiment went awrywhen only five miles of the tether were unwound from the spacecraft at about190 miles above the Earth before the capsule was released, Lyndin said. The reason for the problemwasn't immediately clear, Lyndin said. "It could be that the tether gotstuck," he added. The Fotino is equipped witha radio beacon to allow experts to track it as it glides down through theatmosphere, and Mission Control will try to calculate its current orbit todetermine when and where it will land, Lyndin said. "The results of theexperiment could be considered partly successful,'' it said. Roger Walker, the projectmanager for ESA's Education Office, also played down the glitch, saying on theagency's Web site that it was a ``largely successful demonstration'' and thatthe agency was proud of the students' work, even though full deployment was notreached. Lyndin said there had beenother experiments involving tethers deployed in space, but they were not thatlong and did not carry parcels. The tether deployed Tuesdayis .0196 inches thick and is made of Dyneema, which the ESA said is used bykite surfers. Associated Press WriterMike Eckel contributed to this report from Moscow.